Black-eyed peas may be best known as a southern New Year’s Day tradition (or as famous musicians), but they are very delicious and offer several health benefits. 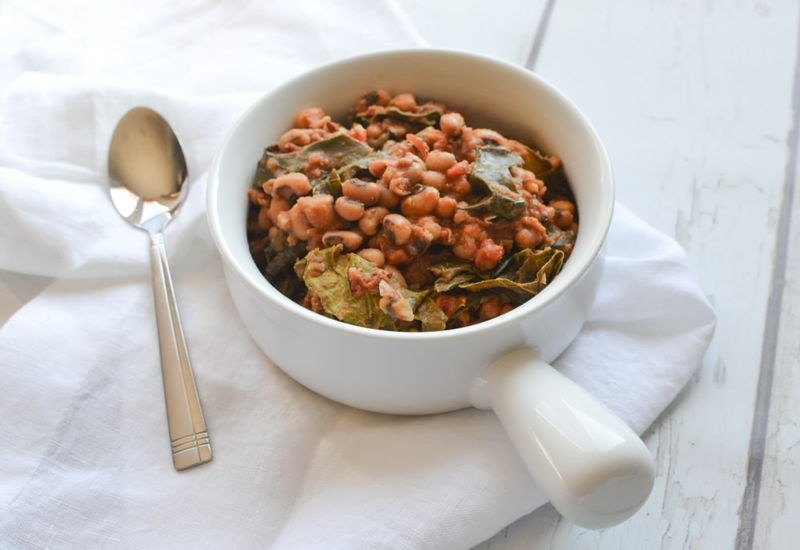 This dish features dried black-eyed peas prepared in the pressure cooker with collard greens, tomatoes, and roasted red peppers. It's the perfect combination of flavor and spice. If you can't find collard greens, don't worry. You can use chard or kale in place of collard greens. Cook and stir onion in hot oil until softened, about 5 minutes; add fire-roasted red peppers and garlic and cook until fragrant, about 1 minute more. Season vegetable mixture with allspice, crushed red pepper, and salt. Pour vegetable broth into the pot; add black-eyed peas and the bay leaf. Stir tomatoes and collard greens with the peas. Select Pressure Cook (Manual) and cook for 1 minutes on High pressure. Season peas and greens with salt to serve. In the Southern United States, eating black-eyed peas or Hoppin' John is thought to bring prosperity in the new year. The peas are typically served with greens, ham and cornbread. The peas (since they swell when cooked) symbolize prosperity, while the greens signify money and the cornbread represents gold. Sounds like a delicious way to ring in a new year! Per Serving: 109 calories; 2g fat; 17.8g carbohydrates; 6g protein; 0mg cholesterol; 259mg sodium. I admittedly only made this to get rid of the rest of the bag of black-eyed peas I had bought for new years, but am glad I gave it a shot. I didn't use collards. Replaced them with kale, because I live northwest and not south (we CAN get them, but kale is everywhere, so . . . cook what youhave!). The fire-roasted tomatoes were key for me. Great flavor addition there. These are really delicious black eyed peas and greens. I love this healthy-take on a southern classic. My family always usually makes it with smoked ham or turkey in a slow cooker, and it takes forever. This pressure cooker version makes it really quick and easy to throw together. Black eyed peas are super underrated, they're very nutritious and I'm going to start making them more often. Also, not having to soak the beans over nice is a huge win! I added extra broth because I prefer a more soup-like consistency for my black eyed peas. Other than that, this recipe was really good. I love that it's a vegetarian version, more healthy than the traditional southern style my parents make. The greens are also a must! I wasn't a big fan of the tomatoes and red peppers added to this black eyed peas dish. However, I did love that this recipe didn't include in meat, like ham or turkey, that you would find in most traditional black eyed peas recipes. The flavor was really good, but next time I'm going to leave out the peppers and tomatoes. I used spinach instead of collard greens for my black eyed peas and they were delicious. The tomatoes also add a nice touch. I used regular diced instead of fire roasted, and thought it was really good. Broke my southern traditional way of cooking black eyed peas and collards and made this recipe for our New Years dinner. It was amazing!!! I added my ham bone left from Christmas dinner and added 5 more minutes to the final cooking time. Wonderful!!!! Made the best pot of black eyed peas thanks to Mealthy. I wanted a more soupy version. Sautéed celery, onion, red bell pepper, fresh garlic clove. Added a box of low sodium veg broth, one and half cups of dried black eyed peas, a ham shank, salt, pepper, sage, thyme and a very small pinch of cayenne pepper. Pressure for 30 minutes, naturally released pressure. Cut up meat from ham hock and added to soup. So very good. Very good! I used a pound of black-eyed peas & upped the broth to a quart. I also added a smoked ham hock and diced ham. It was very good! Not sure I'll use the tomatoes next time. Very flavorful however the peas were a little crunchy. Next time I will set them to cook for 7 minutes.